Looks like I might be able to work out all the last minute details and make it to the CPanel Conference 09 in Houston, Texas next week (5th, 6th and 7th of October, 2009). Karanbir and his wife are flying over from London to make the event. We are also possibly going to have some kind of CentOS social event or meeting on the October 8th, so if you are in Houston and might like to do something like that then contact me or Karanbir on IRC (freenode, #centos-social) or e-mail. I am really looking forward to seeing Karanbir in person for the first time and meeting his wife. I am also looking forward to meeting Garry Dale, who is helping at the event and pretty much put most of this together. The CentOS 4.8 i386 install media has an option for the older i586 processors, as well as the normal i686 installer. The only problem is that the i586 kernels are broken on the released install media for CentOS 4.8. If you need i586 install media, you can download them from here. Since the upstream product on which CentOS is based does not support i586, we decided to fix the issues and release an i586 installer separately so as not to impact the already released products. One of the main reasons we do not want to change the OS directory to be different than the released ISOs is that we know some people use jigdo (and probably other things) to create installable media from the mirror trees instead of downloading both the trees and the DVD, etc. There are now posted to CentOS Extras for CentOS 4 and CentOS 5 new packages for NX (nx-3.3.0-14) and FreeNX (freenx-0.7.3-2). NX is an enterprise-class solution for secure remote access, desktop virtualization, and hosted desktop deployment built around the self-designed and self-developed NX suite of components. Please see the NoMachine web site for more information about the NX libraries. FreeNX is a GPL implementation of the NX Server and NX Client Components. See the FreeNX website for more information. The NX packages in CentOS Extras are built from the OSS sources from NoMachine and provide the NX libraries, and the FreeNX packages provide the required server software to use the NX libraries. CentOS also provides an NX client called QtNX (qtnx-0.9.0-3), but only for CentOS 5. See the CentOS Wiki for information on using NX and FreeNX on CentOS. The DRBD packages in CentOS 4 and CentOS 5 will soon be updated. Each CentOS version has two DRBD versions. CentOS 4 currently contains DRBD 0.7.25 (which it was released with) and the newer DRBD 8.2.6. There will be 2 upgrades to CentOS 4. The first is that a new kernel module for DRBD 0.7.25 will be released that is kABI based. This means that you will be able to use it on multiple kernels, and not need to reinstall it. The packages will be kmod-drbd-0.7.25-4.el4 and should be a direct replacement for the current kmods if you are using version 0.7.25 of DRBD. I recommend that if you are using this version if DRBD, you upgrade it to DRBD 8.3.2 or higher instead. The upgrade from DRBD 0.7.x to DRBD 8.3.x is not trivial, however there is no longer any support for DRBD 0.7.x from Linbit, so I would recommend and upgrade after CentOS releases the 8.3.x version discussed below, that you upgrade to 8.3.x. Here is an article from Florian Haas on upgrading from version 0.7 to 8.2 (or greater) DRBD. Currently CentOS 4 also contains version 8.2.6 of DRBD with newer versions of DRBD in the Testing Repo. If you planning new DRBD installations, please use 8.3.2 or later versions and not 8.2.x or 0.7.25 versions. 1. Login to your Secondary Node. Verify this is your secondary node with the command service drbd status. 3. Turn off heartbeat on the secondary node with the command service heartbeat stop. Check your primary node, it should still be running heartbeat and DRBD. The secondary node should only be running DRBD. 4. Turn off DRBD with the command service drbd stop. At this point, you do not have DRBD running on the secondary node. 7. Install the upgraded drbd83 and kmod-drbd83 with the command yum install drbd83 kmod-drbd83. Note: you may need to substitute upgrade for install if this is an inplace upgrade of drbd83. 8. You will now likely need to reboot on the new kernel, but you do not want drbd and heartbeat to start up on the reboot, so for now do these commands chkconfig heartbeat off AND chkconfig drbd off. Reboot your secondary node machine and log back into it. 11. You should now have your secondary DRBD node back to normal. You should be able to now to login to your primary node and turn off heartbeat on it and have the secondary node pick up as primary using the command service heartbeat stop on your primary node. 12. You should now have your Normal SECONDARY NODE as your current primary and normal primary node as a DRBD secondary with heartbeat turned off. If that is the case, you should be able to upgrade the primary node using steps 2-11 above (skipping step 3) ... substituting primary node for secondary node in the instructions. Note: When you start heartbeat on the normal primary node, all the loads will move from the secondary mode to the primary mode, so make sure DRBD is running properly before restarting heatbeat on the primary node. CentOS 5 currently contains DRBD 8.0.x (which it was released with) and DRBD newer 8.2.6. DRBD 8.0.x is the stable tree, and if you want to use it, it is currently supported. Version 8.0.16 will be released as part of this update. The basic steps to upgrade will be the same as in the procedure above, substituting drbd and drbd-kmod for drbd82 or drbd83. As long as LinBit supports the 8.0.x tree, CentOS will do the same. All of the information in the CentOS 4 Version 8.3.x section is applicable to CentOS 5 as well. The upgrade outline is also the same. The updates should be released in the next week, so be looking for them on or before Saturday, September 5th, 2009. The CSGFS (Cluster Suite / Global File System) repository for CentOS 4 has been updated after the release of CentOS 4.8. All the latest Source files have been built and added to the repository. There is one known problem of Missing SRPMS for lvm2-cluster. A bug has been filed upstream asking for the release of this SRPM. In the mean time, you need to run a lesser version of lvm2 from the main CentOS-4 repository on your Cluster servers. My name is Johnny Hughes. I am one of the lead developers at the CentOS Project, which releases the Linux operating system called CentOS. I am currently the Project Lead on the CentOS-4 version of the distribution. The current release of CentOS 4 is version 4.8 which was released on August, 21st 2009. CentOS 4 will be supported with security updates until February 29, 2012, although if you are planning a new deployment you should probably use the latest version of CentOS, currently CentOS 5. CentOS rebuilds sources from Red Hat Enterprise Linux, and will release updates as long as they are released upstream. For Red Hat's policies and lifetimes, please see this link. 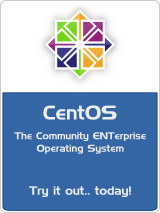 If you are looking for help with CentOS please see Getting Help on the CentOS Wiki.